The AAMID consortium, which is working on the Mid Frequency Aperture Array (MFAA), is an Advanced Instrumentation Work Package, aiming for the realization of a large aperture array system for the full SKA. Working in the frequency band up to 1.4GHz, it will cover the HI emissions up to a redshift of 3. The key advantage of AAs is the capability of observing a very large Field of View, which results in an unsurpassed survey speed. Furthermore, AAs are capable of generating multiple independent FoVs, enhancing the efficiency of the system, for calibration and for multiple concurrent observations. The consortium is working hard on setting the right requirements for SKA phase 2 in conjunction with the SKAO. Much of this has been discussed at a recent All-Hands meeting in Aveiro, Portugal. A sub-set of the consortium work is described below. 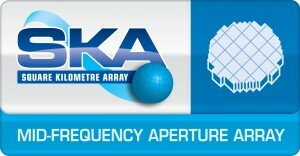 EMBRACE (Electronic Multi Beam Radio Astronomy ConcEpt) is a pathfinder for the SKA, which is demonstrating the viability of the MFAA technology. The two EMBRACE arrays, one in Westerbork, and one at Nançay, were largely funded by the EC-FP6 programme SKADS during the period of 2005-2010. 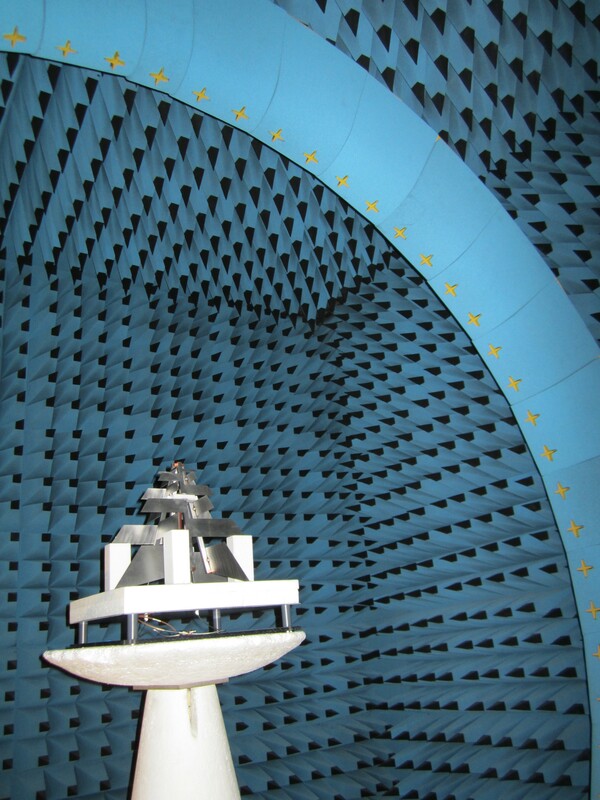 The EMBRACE array at Nançay was installed during 2010, and had begun early testing with the partial array that same year. EMBRACE located at Nançay is an array of 4608 single polarisation Vivaldi antenna elements organized into 64 tiles, giving a total physical area of 70m2. Over the past four years a number of observational successes have been achieved including the high spectroscopic resolution detection of an extra galactic source, the galaxy M33. We have also made pulsar measurements (B0329+54 and B1133+16), which took advantage of the recent opportunity to measure the partial solar eclipse on the 20th of March 2015. EMBRACE has begun to demonstrate its promised capabilities, such as multi-beaming and multiple simultaneous observing modes. For example, we have performed multi-beaming observations with different frequency selections, and also different sky pointing’s. It has also demonstrated fundamental requirements such as source tracking, ease-of-use, and long-term reliability and stability. 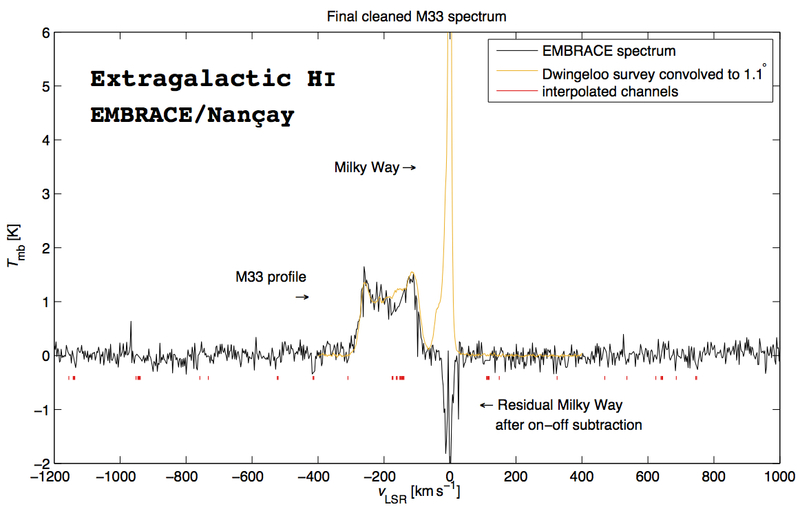 EMBRACE at Nançay has also been running a programme of daily pulsar observations. It uses saved calibration tables, which continue to still be valid after more than six months, and delivers pulsar data every day. After more than four years of operation EMBRACE has had no hardware failures, showing that MFAA technology is robust and reliable in the long term. The Monitoring and Control (MAC) system developed at Nançay has proven to be a key ingredient in the operation of EMBRACE, which is a very complex system with numerous parameters that are configured for each observation. However the MAC provides a simple Python interface, which has permitted for easy configuration of the daily pulsar observations, as well as other observations such as the solar eclipse observation, which was done without interrupting the pulsar-observing programme. The large Field of View for MFAA technology makes it an ideal instrument for the detection of Fast Radio Bursts. This technology is unequalled by any other, and it demonstrates that EMBRACE can be relied upon for robust, remarkably stable and ultimately easy to operate technology. A proposal in collaboration with Dan Werthimer and Andrew Siemion has recently been awarded funding by the France-Berkeley Fund which will enable Andrew Siemion to spend time at Nançay where he will setup an FRB monitoring system with EMBRACE. We are looking forward to starting this project in the coming months. During the development of instruments such as EMBRACE, there are numerous design drivers that are difficult to determine theoretically. Nevertheless, they have a large effect on the requirements. Environmental aspects such as dust, dirt, vegetation, water, bugs, rodents and other wildlife are key obstacles that will play a major part in the overall success of the design. These have to be combined with further cost reduction for mass production. Four prototypes have been deployed at the South African SKA Karoo site for a sustained period of time (3+ years). The goal is to learn which concept or sub-concept performs best and which environmental aspects are the most important to focus on. The collection of the four prototypes on the SKA Karoo site. Apart from the prototypes, a test setup on the anchors have been created. This setup holds a number of selected anchors, attached to a bag of sand (15 kg). The selection of anchors were executed in two phases. First, the maximum holding power of each type of anchor was tested by sheer muscle power, in combination with a spring balance. After that, a long-term test setup was assembled and placed near the PAPER and KAT-7 arrays. This setup will be in place for several years to see how aspects like corrosion, flooding and wildlife will influence the different anchoring methods. 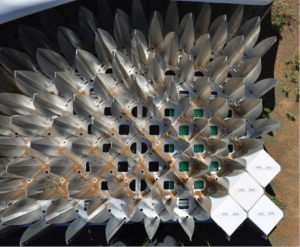 Top view of the continuous array with open station cover. Surprisingly, we find a very limited amount of dust/sand inside the array. A sparse array of log-periodic antenna elements can drastically improve the sensitivity per receiving chain and therefore has the potential to reduce the cost of the AAMID antenna array, when compared to a fully dense array. The SKA log periodic antenna designed by the University of Cambridge is also designed to use single ended LNAs, which provide a substantial reduction in the LNA power consumption. The latest element design has now been tested at the “Stargate” pattern test facility located at Cambridge Consultants. This facility, based on a 63 probes ring, can produce 3D pattern results in a matter of minutes. The results show the innovative single-ended feeding result in symmetric beam patterns. We are now working on building a 16-element array demonstrator at the Lord’s Bridge observatory.